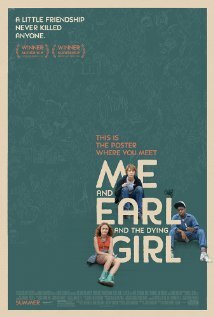 Movie Review: When taking into account the themes of “Me and Earl and the Dying Girl”, a glorious coming-of-age comedy-drama written by Jesse Andrews (based in his own novel) and directed by Alfonso Gomez-Rejon (his sophomore feature film), we must conclude that its crew and cast were capable of pulling the film out of standardized comfort zones. The young actor, Thomas Mann, is delightfully awkward when playing Greg, a senior at Pittsburgh's Schenley High School, who likes to cultivate his invisibility by remaining in good terms with everybody but never in a way that’s not casual or mellow. He’s best friends with the lazy Earl (RJ Cyler), a long-time partner in the making of a few secret short movies that aim to ridicule the classics. Greg is compelled by his intrusive mother to call Rachel (Olivia Cooke), his fellow student and former childhood friend who was diagnosed with leukemia. Regardless the extreme reluctance of both, Greg and Rachel start seeing each other at her place, and their encounters can be described as weirdly enjoyable. Greg’s presence is always fully embraced by Rachel’s single mother, Denise (Molly Shannon), who finds him modest and handsome. After some time, a strong bond consolidates, triggering some spiteful commentaries by some mean colleagues who affirm that Greg just speaks to Rachel because she has cancer. However, Greg’s hot crush, Madison, suggests he could make a film for Rachel. Amidst some quarrels with the presuming Earl, Greg seeks inspiration for the film in order to please his dying friend, the one he always manages to cheer up, receiving in turn, some rebukes about his lack of initiative and some orientation regarding important fast-approaching choices. In addition to its congenial offbeat tones, this giving/receiving exchange is the key to the beauty of the film. Other few stupendous occurrences deserve to be mentioned – the one when Greg and Earl got accidentally on drugs is hilarious. Gomez-Rejon’s camera moves confidently and dares to some inventive angles, intelligently mounting frames that are as much idiosyncratic as its characters. Packed with refreshing good ideas, this is a rich, rewarding story whose finale is beautiful, sore, and touching.